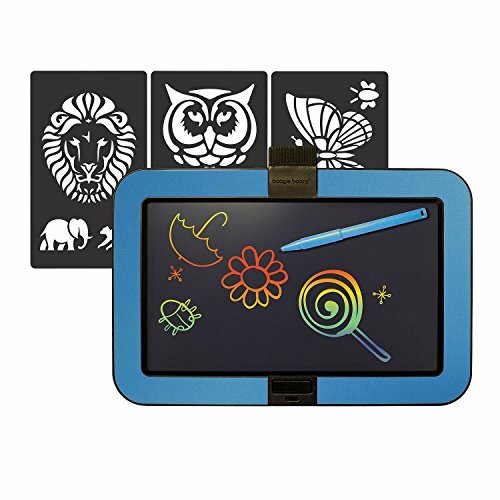 Dashboard by Boogie Board eWriter Featuring Color Burst, Blue | Replicafer Co.
Dashboard by Boogie Board featuring Colorburst is the new Boogie Board eWriter in bright, vibrant rainbow colors. It's great for home, travel, outdoor, and on the go! Eliminate the need for paper, scratch pads and sticky notes � simply write and erase. The durable, ultra-lightweight LCD writing screen is engineered to feel just like writing with pen on paper. The image stays as long as you need it to and can be erased with the touch of a button. Create again and again without the need to charge or connect. Use the free Dashboard app to scan, save, and share your work! If you have any questions about this product by Boogie Board, contact us by completing and submitting the form below. If you are looking for a specif part number, please include it with your message.